This week's "seek", is a 2004 Playoff Honors Alma Mater Materials AM-35. It's a dual jersey swatch memorabilia card, featuring both Herschel, and Shaun Alexander, who went to Alabama. 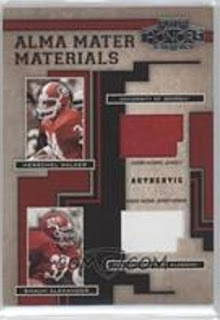 The single player card of this issue, featuring just Herschel, and a swatch from a Georgia jersey, is #AM-22. That card is already in the Hoard. The above image is courtesy of COMC.